Targus Australia New Zealand has today unveiled its first-ever out-of-home media campaign to show off the brand’s fresh look and reinvigorated proposition. 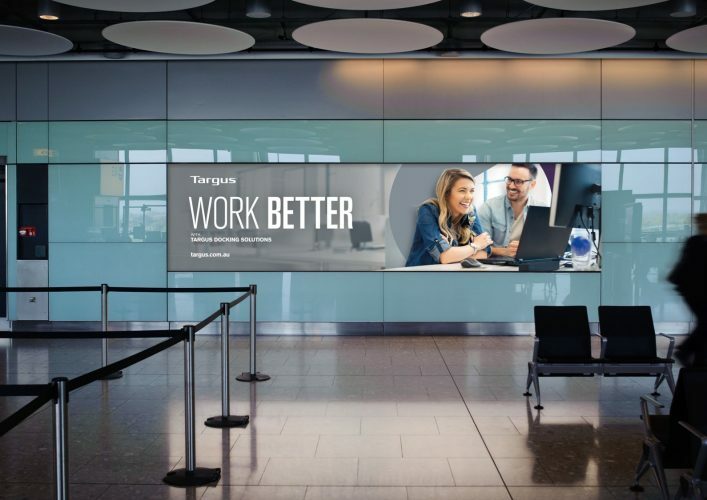 Showcasing how Targus connects people and technology, the campaign has been developed by the local arm of international independent brand design agency SomeOne, alongside a media strategy developed in collaboration with Sydney-based agency Uberbrand. The campaign for the mobile technology accessories provider is rolling out in capital cities both in Australia and New Zealand. High-impact digital, rolling and static advertising formats will feature within airports and alongside main roads into key cities, street talkers in high-foot traffic areas, bus backs and shelters, and railway stations. Targus’ general manager for Australia and New Zealand, Claire French, said the company is already shifting perceptions in the market and has been dialling up marketing and brand activity across the board to supercharge awareness and affinity with both business and consumers. “Targus is a brand known and respected for reliability and quality, but we also have strong innovation and style credentials, which we are looking to celebrate and showcase,” she said. SomeOne creative director Max Longstaff said: “This is about putting Targus at the forefront of the conversation on modern work – matching consumers’ varied needs with a unique breadth of product.